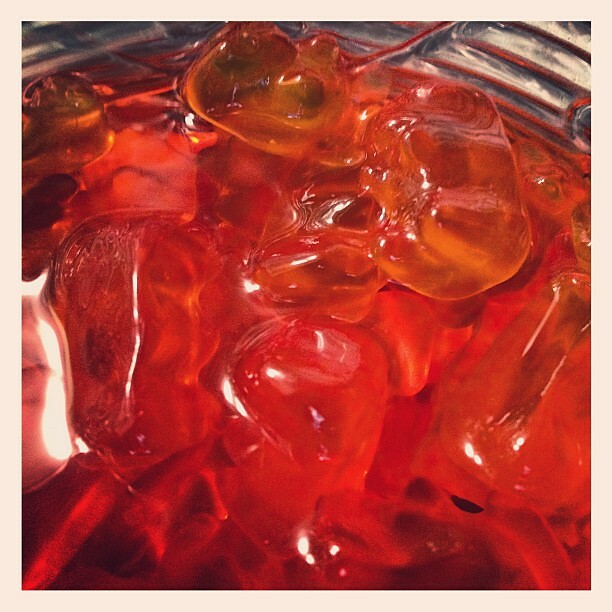 Drunken gummy bears partying in a Negroni. So I batched up some rum and cola gummies, Negroni gummies, raspberry tequila gummies (my bad, I thought the red gummies were strawberry when in fact it’s the green ones that are) and strawberry absinthe gummies (just used green gummy bears to keep in theme with green fairies). By the way, got the idea for the absinthe gummy bears from an NYC bar that is no longer around. Here’s my slight variation on the Serious Eats recipe. And this should be obvious but drunken gummy bears are most definitely not for kids! Gather your ingredients: Cola gummies and gummy bears (I used the Haribo bag) and your desired booze. It might have been smarter to actually use cheap booze for experimentation, but I just couldn’t bring myself to. Pour your desired gummy flavor into a glass/ceramic bowl and then fill the bowl with your favorite spirit, just barely covering the candies. Online recipes vary from just below the gummy bear line to an inch over the gummies. It really depends on your preference for booziness. For my Negroni gummies, I separated out orange gummies and filled the bowl with equal parts Campari and Bluecoat Gin. For the rum and cola, I just used some Captain Jack someone left behind at a past house party. For the tequila raspberry, it was a silver tequila. And for the absinthe bears, I used Vieux Carre Absinthe which, since pricey, I just made a tiny batch of bears. 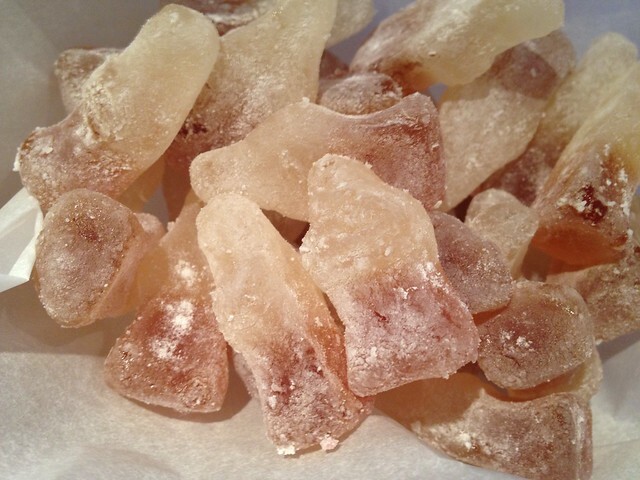 Rum and Cola gummies dusted with powdered sugar. Cover the bowls with Saranwrap and stick in the refrigerator for five hours. Yes, unlike the SE recipe, I stuck them in the fridge because I read too many horror stories of the bears melting into a big gummy mess when left out at room temperature. Regarding infusion time, I had researched the Internet trying to find the ideal amount of time to leave the gummies stewing in the booze. And stated infusion times varied from 24 hours to a week. But I went with SE’s recommended five to eight hours (“the sweet spot”), although I let the absinthe bears stew longer just to see what would happen. I figured that the usual drunken gummy recipes that use the days method just want to obliterate the gummy bears’ flavors which isn’t my goal here. Plus when left in longer, the bears lose their gumminess and get all jiggly. After two hours, stir up the bears so they don’t meld to each other. When the five hours are up, drain the gummies using a colander to toss them and then pat them with a paper towel. Afterward put them in a Tupperware and return them to the fridge for storage. Apparently they can keep longer in there. Some recipes say you can just serve them with toothpicks but I dusted them with powdered sugar which made them easier to separate and serve but also made them too easy to pop in my mouth. However, if you go the powdered sugar route, don’t dust them before storage as they will just get wet again. Man, these things are slimy. How Wasted Did the Gummy Bears Get? Drunken gummies (L to R): Negroni bear, rum & cola gummy, tequila raspberry bear, absinthe gummy bear. After five hours, the Negroni and tequila bears just had a hint of booze. Think more buzzed than wasted bears. There was none of that alcohol-y burn that the vodka recipes reported. The rum and Coke gummies had a nice mix of the sweet rum and cola flavors, but again the booziness wasn’t overt. I can see the tequila bears and rum and cola gummies being more popular at parties for their mainstream appeal. My taste testers really liked the rum and cola ones. The Negroni bears, like the cocktail, may be a required taste with its strong bitter, sweet flavor. They basically taste like orange peel. I had ended up soaking the green bears in the absinthe for 14 hours total and they absorbed the spirit perfectly, so they were potent but sweet. Turns out absinthe is the missing gummy bear flavor! And despite the longer soak time the bears still retained their shape and, surprisingly, their firmness. Which leads me to believe that the Negroni and tequila bears could stand for soaking a little longer in the booze should you want a more potent flavor. As it is, I liked the nuanced flavors of the spirits. Again, for me it’s about the flavor and not getting wasted. Can’t wait to experiment with other liquors. Any suggestions for the perfect drunken gummy bears flavors? Yeah, they do! And I got a bad drunken gummy bear hangover thanks to them. Never mix your cocktail gummy bears! I just made Malibu rum drunkin bears. Yummy!! I make Tequila Gummi Bears regularly. If you give the soaking a few days, four 5 oz bags (20 oz total) of the Haribo Gold-Bears will absorb an entire fifth (750ml) of tequila. Like you mentioned, keeping them in the fridge overnight will produce what appears to be a block or gummi bears. Not to panic. With a little coaxing, you can separate them all and place them back in the tequila. You’ll have to do this a few times but the process gets easier each time as the little guys absorb more booze. Once all of the tequila is soaked up, I rinse the bears in a strainer/colander thoroughly to remove the sliminess, otherwise your guests might be less inclined to enjoy them. Hope this helps. Good luck! I’m sure they’ll be fine and tasty. Gummi peaches in peach schnapps? Hmmmm. Might have to try it!! I’d love to make the Absinthe gummy bears! Anyone know if there are green gummy bears that are not lime flavored?? I pulled the green ones out and soaked them in absinthe (the rest in vodka and did some coke bottles in rum). The absinthe ones were fantastic and turned out the best. The vodka ones were great Also but no one liked the coke/rum ones. Will have yo try rinsing them the next time as another poster suggested. The powered sugar çoating got icky quick, would not do that again either. The only ones I am finding are green apple which doesn’t mix with green apple! Yuck!! Thank you for any tips!! Really? But when you leave them in the drink long enough doesn’t it overpower the gummy bear flavor? I really want to try making champagne gummy bears for my friends bachelorette party! I’m wondering if the soak times would be different or if there’s any other unforeseen hiccups with using champagne?? Also, how quickly should you consume the bears? Can they keep for a week or so? I’m not sure how the gummy bears would react in fizz. But I have seen recipes on how to actually make champagne gummy bears. Involves more than soaking though. As for how quickly you should consume, I suppose you can freeze them to keep them.